A lovely blue sky day. Unfortunately it was time to return home. Julia set off to Tewkesbury after breakfast, but Sue and I lingered in the sunshine and enjoyed the short but delightful walk up Moel-y-Gest (262 metres). 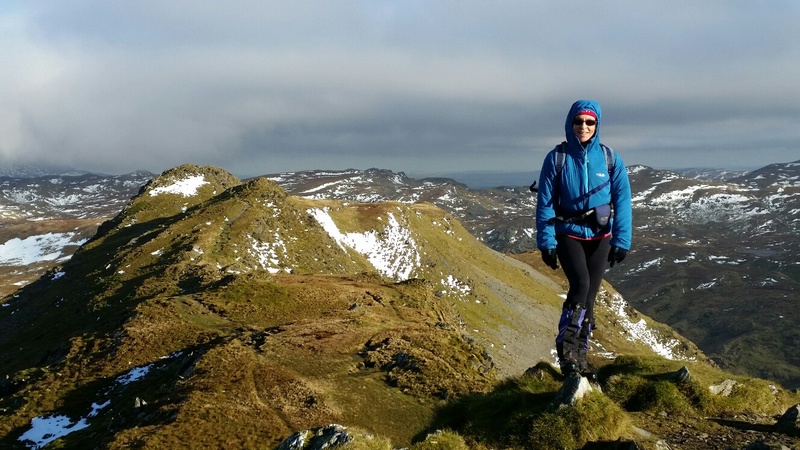 Sue is pictured on the summit, with fine views to Snowdonia. Then we really did go home. 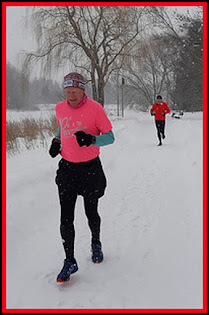 Routes and slideshow to follow. 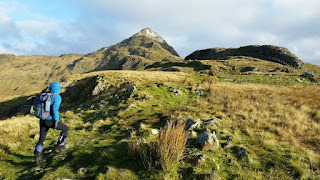 Cnicht is one of my favourite hills. After having had its head in the clouds for most of the week, today it beckoned us on. 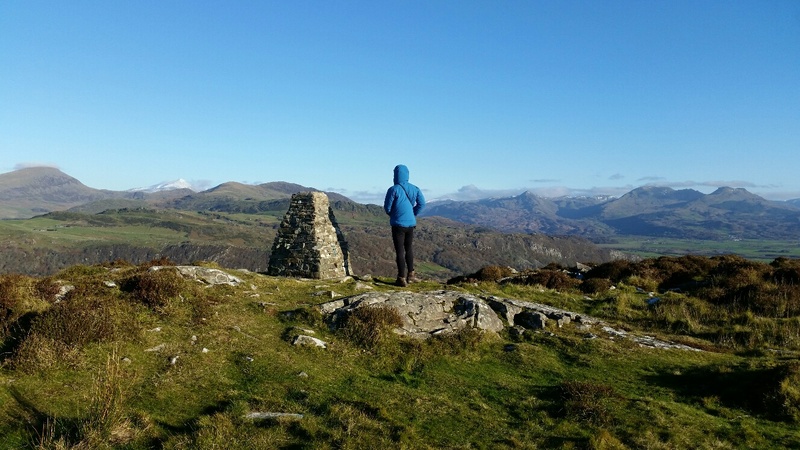 From Porthmadog you can see why Cnicht is sometimes known as the Matterhorn of Snowdonia, a description analogous to Shutlingsloe's status in Cheshire. George Borrow was more flowery with his words about Cnicht, describing it as 'the conical peak impaling heaven'. Wow! Not being inclined to return down the precipice, Sue and I continued along the ridge to the north eastern summit and on to Llyn yr Adar. At this point there is a grandstand view towards Snowdon and a number of the other high peaks of Snowdonia, but today they were very reticent in their grey caps. Soon we were meandering around the head of Cwm Croesor towards Llyn Cwm-Corsiog. It was boggy at times. An excellent sheltered spot was found for lunch. 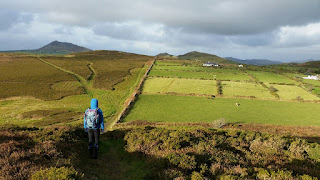 Then we headed to a tramway, from where a good path leads back to Croesor, avoiding a couple of steep inclined planes. Back at 2.30 or so, we finished our flask of tea on a comfy bench before heading back to base, with some good views towards a distant, snow laden, Snowdon, the wind having finally released parts of that massif from the cloud. 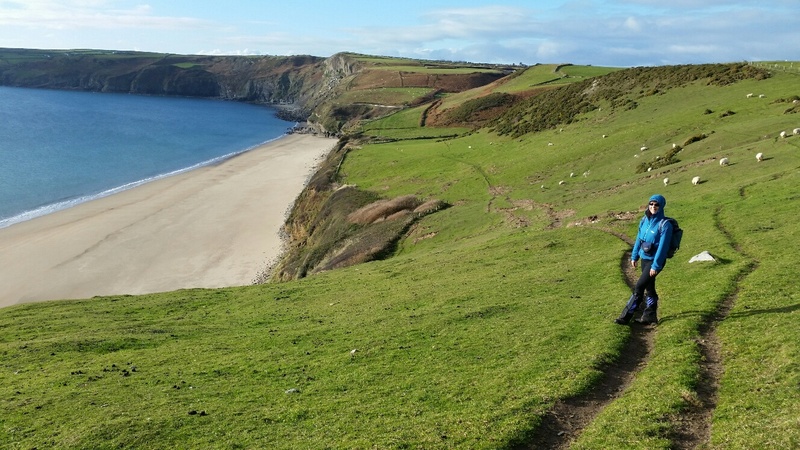 Julia arrived back a little later, having enjoyed a sunny day on the Lleyn Peninsula . 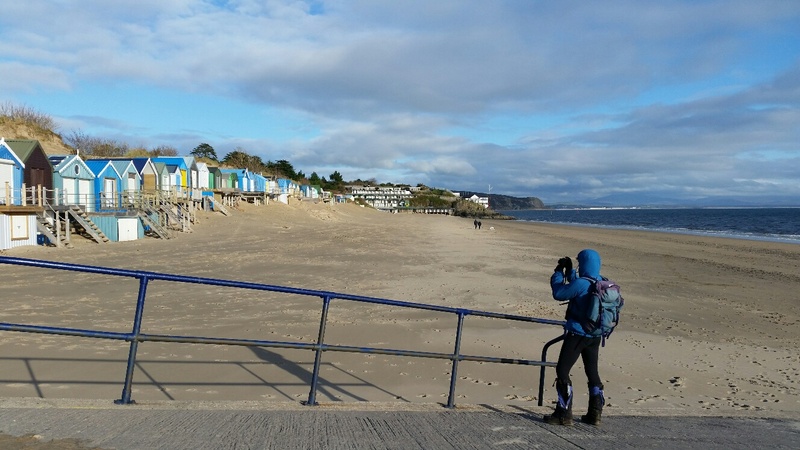 A visit to Abersoch placed Sue and me in the sunshine for the day. 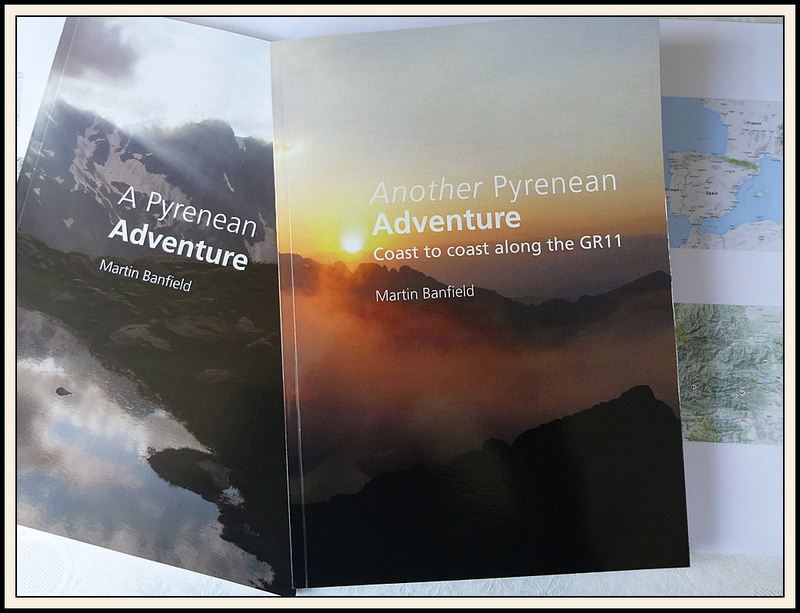 Julia chose to visit Blaenau Ffestiniog, where it was cooler, with thick low cloud and little of a view. We enjoyed a couple of circular walks. Firstly, along the beach (pictured - top) then around the coast path to Porth Ceiriad, a rather attractive if deserted beach (also pictured). We enjoyed lunch in a sunny, sheltered spot, before returning along pleasant paths and lanes, and across the busy golf course where one elderly chap politely doffed his cap when we applauded his putt. After that 10 km circuit we moved on a short way to the National Trust parking spot at Mynydd Cilan. Setting off to find the coast path, we were passed by a farmer in his 4WD. 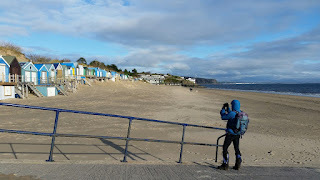 Like everyone else we encountered in this small outpost of Abersoch, he gave us a cheery wave. 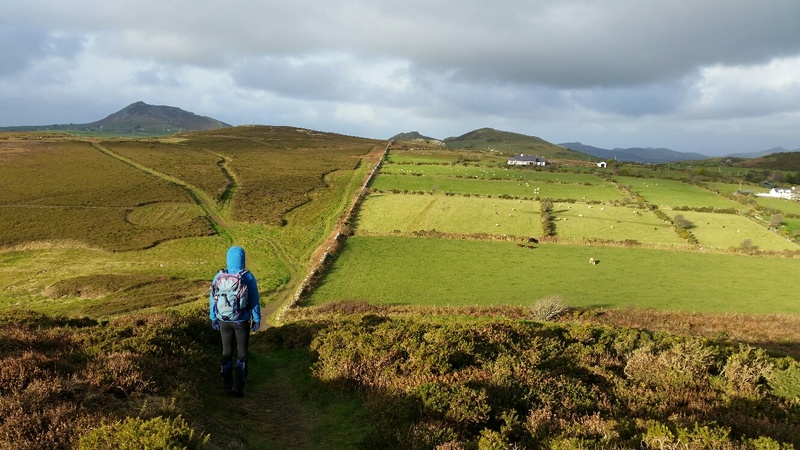 The light was lovely as we strolled up to the trig point by a small reservoir, and then along the coast with good views of the western end of the peninsula and Bardsey Island. Photos will follow in the form of a slideshow in due course. 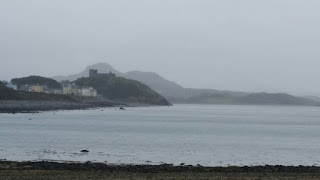 Sue and I went to Criccieth, where Julia investigated the castle. It was cool and a bit rainy, so we warmed up with a brisk stroll along the coast path. There were fine views back to the castle, silhouetted against the backdrop of Moel-y-Gest (pictured). We soon left the coast path in favour of heading into Llanystumdwy, where we enjoyed a cuppa in the shelter of the church porch before continuing past flood damaged houses and a monument to David Lloyd George. Considered by some to be one of the greatest statesmen of the 20th century, despite a 'colourful' private life, he grew up here and is buried in the village. He served as a Liberal MP for Caernarfon from 1890 to 1945, including spells as Chancellor and as Prime Minister. He was a charismatic and controversial figure who laid the foundations for the Welfare State. We followed a lovely riverside path for a while before doubling back along a lane to Trefan Farm. Between here and Cefn-y-maen a 30 metre stretch through ankle deep slurry took us by surprise! It was one of those paths that looks concreted, but of course it isn't. We came across a few signs that showed the Welsh at their worst. Instead of polite 'Please close the gate' signs, there are signs such as, simply, 'Penalty for not closing gate £1000'. And on a signposted public footpath, 'Private Land. Your insurance is void'. I digress. After making our way back to Criccieth on pleasant paths and beside a stream useful for boot washing, we enjoyed lunch with a view across the beach into the mist. By the time we reached Mynytho the rain had stopped. 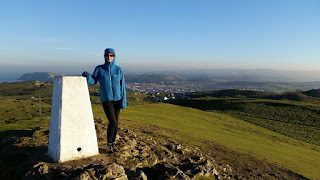 We were soon on the summit of Foel Gron, from where the view to the north is shown above. Onwards then to Mynytho Common and to the remains of a windmill on National Trust land at Foel Felin Wynt. A stile pointed the way down to a path that came to a dead end beyond Foel Bach. Never mind, we come to expect such blockages here; we easily found our way around via a gate. Then we popped up to the summit of Carneddol before returning by a fairly direct route to the car and our unfriendly Welsh neighbours. Or were they Russians? Julia went looking for castles. In the 'old days' she would have come walking with us. An inveterate backpacker well into her 70's, she now has a heart condition that has seriously dented her lifestyle. 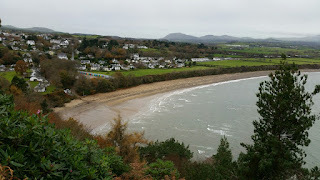 Meanwhile, Sue and I headed down the Lleyn Peninsula to Llanbedrog for a short but blowy stroll over Mynydd Tir-y-cwmwd. It's a lovely walk. Beyond the fine views to Llanbedrog beach (pictured - in the early 19th Century, boats sailed from here to South Wales, Liverpool and Dublin), there's a brand new bench on the summit in memory of Tom Atherton and his daughter, as well as a newish Topograph. The former served us well as we paused for a cuppa. The latter was much more informative than was necessary today, as only a couple of the closest hills could be seen. We made our way down to the magnificent dower house built by Lady Love Jones Parry in 1856. After falling into disrepair in the mid 20th Century it has been lovingly restored to its former glory. 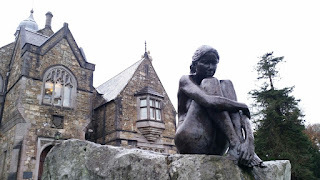 A beautiful bronze sits outside admiring the view to the beach and beyond, shivering a little today. The art gallery is currently celebrating Jan Morris's 90th birthday with offerings from a selection of artists. It's an excellent spot, highly recommended for a visit. It was a struggle for us to leave without buying much more than our lunch. Then we had planned a walk around Mynytho Common. We went to the starting point, but given the driving rain we opted to return to Porthmadog for a gentle stroll around Llyn Bach. (Non) Storm Angus didn't arrive. We have enjoyed a sunny but cool day. William Rufus's motte, built in the eleventh century at Tomen-y-Mur, may have become the site of a castle but for the intervention of Gruffydd ap Cynan, the ruling prince of Gwynedd, who in driving William back to Chester secured two centuries of independence for Wales. Sue and I are shadowed on the top of the motte as we look towards Snowdon in the top picture. A thousand years earlier the Romans had easily over-run north Wales. 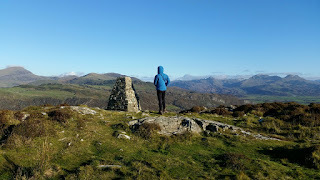 The fort established here on a four-acre site following Agricola's conquest around 78AD, formed the southern corner of a network encompassing Snowdonia. The fort may have been used as a training base for the entire region. After exploring the fort, Sue and I enjoyed an 8 km circuit, nearly reaching the site of some Roman Camps to the east. A local farmer was unsuccesful in his attempts to drive us back to Chester. (We befriended him - it was a struggle but he eventually managed a smile.) Julia was more modest in her aspirations. 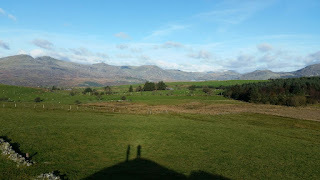 Lunch was taken by the Roman amphitheatre at Tomen-y-Mur, then we drove down to Llyn Trawsfynydd for a short stroll near the nuclear power station that is being slowly decommissioned. 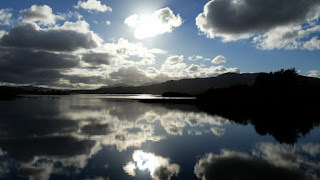 The cloud reflections in the lake were spellbinding. 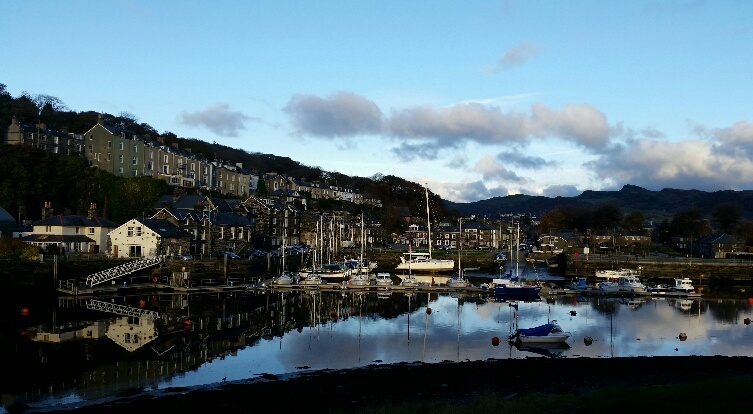 After that the supermarket called, and tea with our landlord at South Snowdon Wharf, before a jaunt around Llyn Bach for Sue and me before the curtains were drawn on an unexpectedly lovely day. Here's our early morning view from the living room. 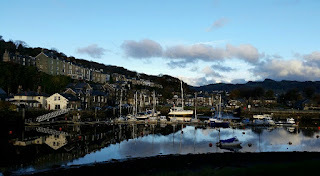 Sue and I popped down here on Saturday afternoon, and were joined by Julia, who is in her 80's and not as fit as she has been, for a relaxing week around Snowdonia and the Lleyn Peninsula. The local Thai restaurant was up to its usual high standard last night. We expected a storm, but it's a sunny morning!